– A marriage penalty or bonus is the change in a couple’s total tax bill as a result of getting married and thus filing their taxes jointly. – Marriage bonuses typically occur when two individuals with disparate incomes marry. 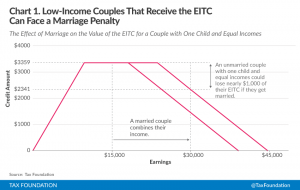 – Marriage penalties occur when two individuals with equal incomes marry; this is true for both high- and low-income couples. – Marriage bonuses can be as high as 20 percent of a couple’s income, and marriage penalties can be as high as 12 percent of a couple’s income. – While research shows that marriage penalties and bonuses do not have much effect on whether a couple will marry, they do impact how much each spouse works.